Van Ness Feldman was named one of the Best Law Firms of its size for Female Attorneys today by Law360’s Glass Ceiling Report. The report surveyed more than 300 U.S.-based law firms on the demographics of their lawyer workforce, and designated firms above average in their representation of female attorneys and female partners as Best Law Firms for Female Attorneys. “We are pleased to be recognized as a law firm in which women are able to advance,” said Mike Farber, co-chair of the firm’s Diversity and Inclusion Committee. “In the past few years we’ve been focusing on ways the firm can provide a variety of different leadership opportunities to women. While the survey results are indicative of our success in this area, we will continue to look for ways to improve in the years to come.” Gwen Keyes Fleming, who joined the firm early last fall, leads the Diversity and Inclusion efforts along with Mr. Farber. Aimed at maintaining and promoting the firm’s diverse talent, the firm has adopted several new policies in recent years, including a formal balanced hours policy where schedules are individually tailored to meet the needs of the professional and the needs of the firm and its clients, and a Lean In Circle, consisting of women policy professionals, attorneys, paralegals, managers and staff, who meet regularly to share experiences and learn from each other. 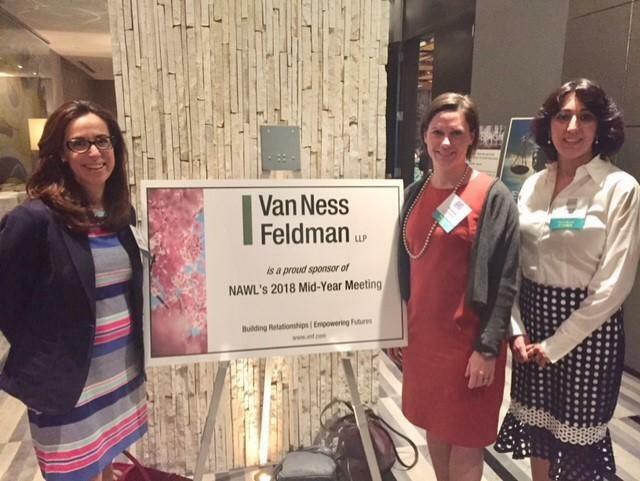 “In keeping with the principles of our founding partners, Van Ness Feldman is committed to fostering a positive environment that attracts talented individuals with diverse experiences,” said Nancy Macan McNally, Managing Principal of the firm’s Washington, DC office. “The firm has been enriched by the advancement of diverse professionals. We view diversity and inclusion as a journey that we are on together at the firm and look forward to continuous growth and improvement in these areas.” Ms. McNally was named Managing Principal in July of 2017—the first shareholder (partner or principal) at Van Ness Feldman to hold such a position.